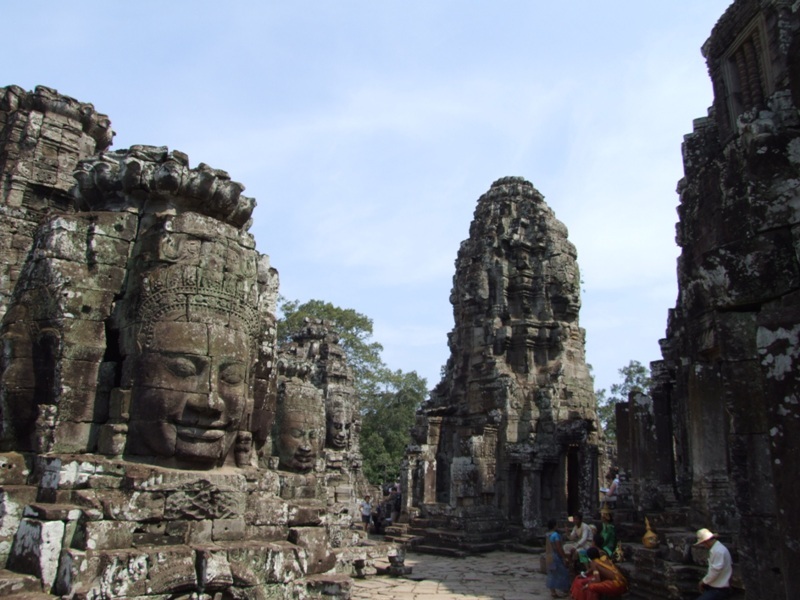 Angkor Thom is a huge Complex that includes a series of gates with Buddha facing in the four directions, the Hall of the Leper King, the Elephant Terrace and Bayon. 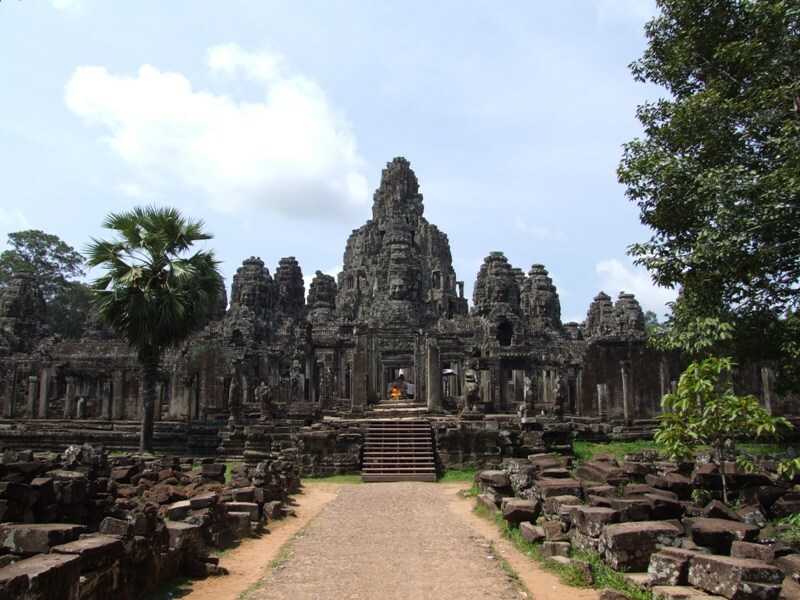 Bayon is the primary temple of the Angkor Thom complex. 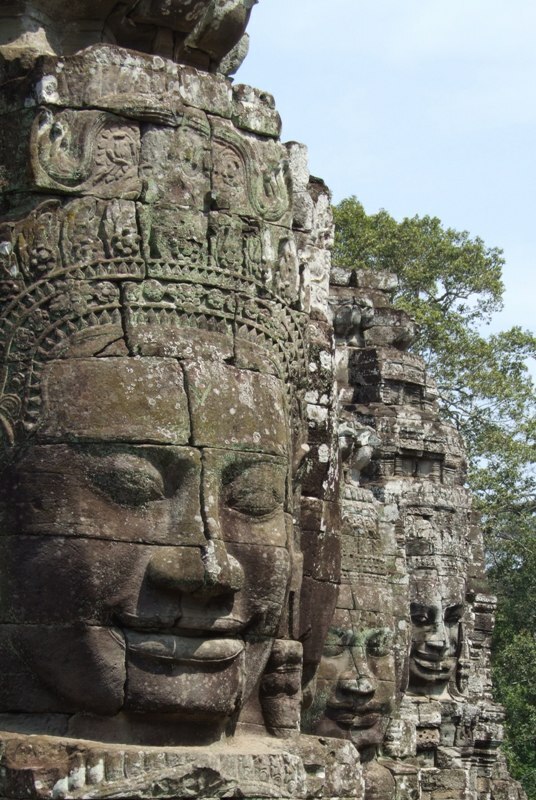 The first thing you notice when you approach the Bayon Temple is the faces on it’s towers. The 200 faces of the Lokesvara which is (and I’m simplifying the concept here a bit) the Compassionate Buddha. There must be hundreds staring back at you. Looking out in every direction actually. All smiling. Welcoming. Enchanting. Captivating all who gaze upon them. Beckoning the visitors to come for a closer look. 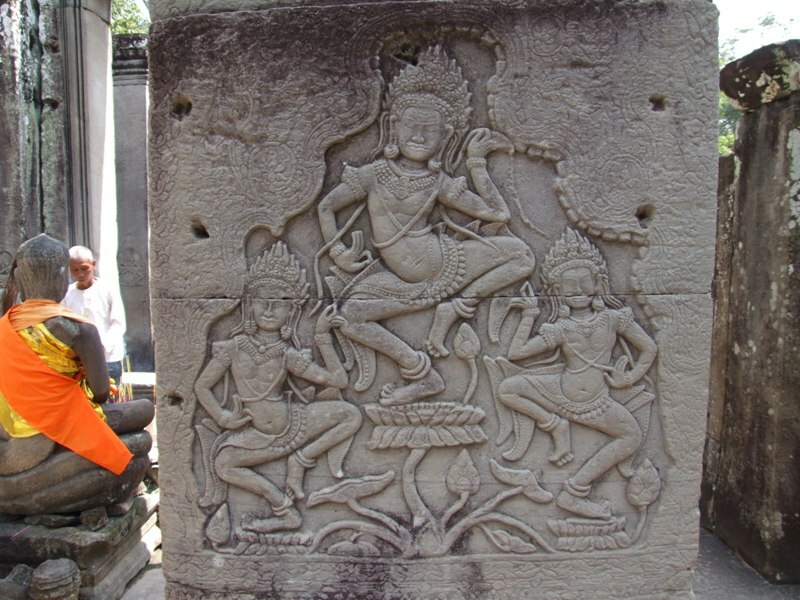 The walls of Angkor are covered with bas-relief depicting tales of war and heroism and everyday life of the Khmer. 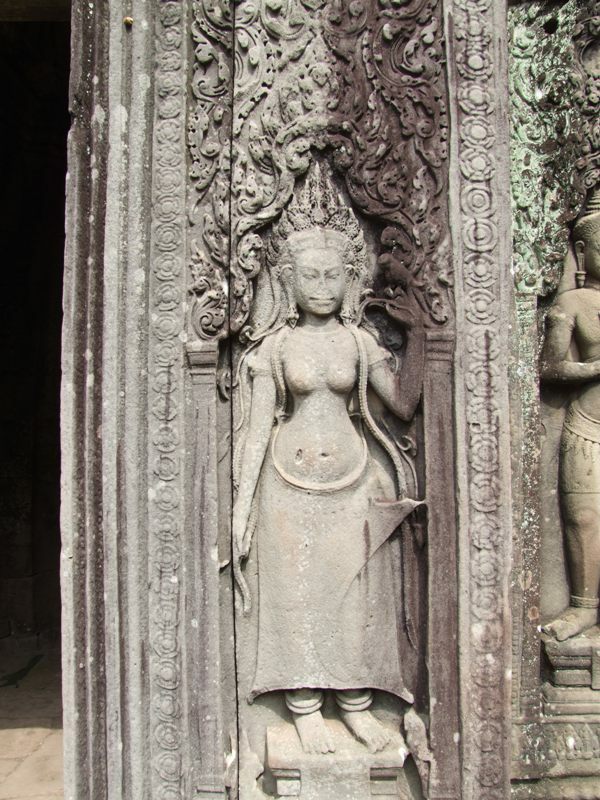 There are also tales from Khmer and Hindu mythology. 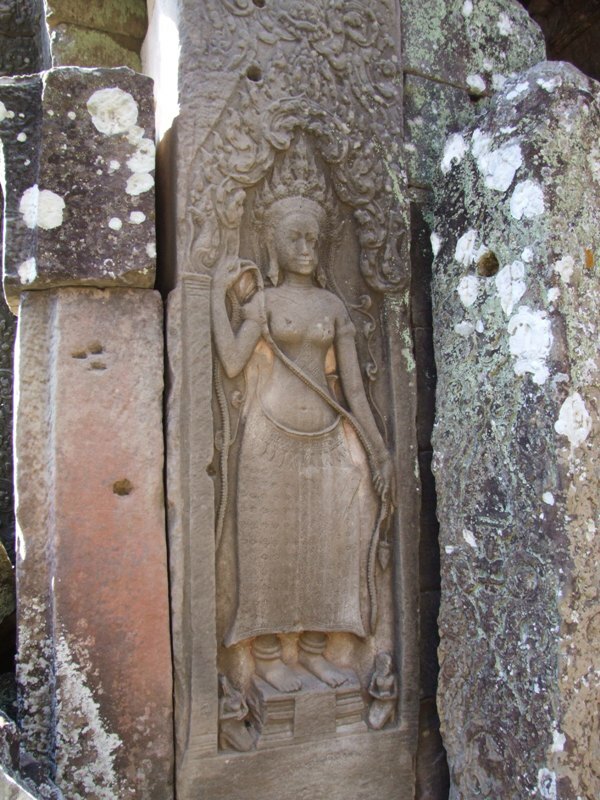 The walls of Bayon speak to the history and beleifs of the Khmer people. Their mythology. Their lives. Who they were and who they have become as a civilization. 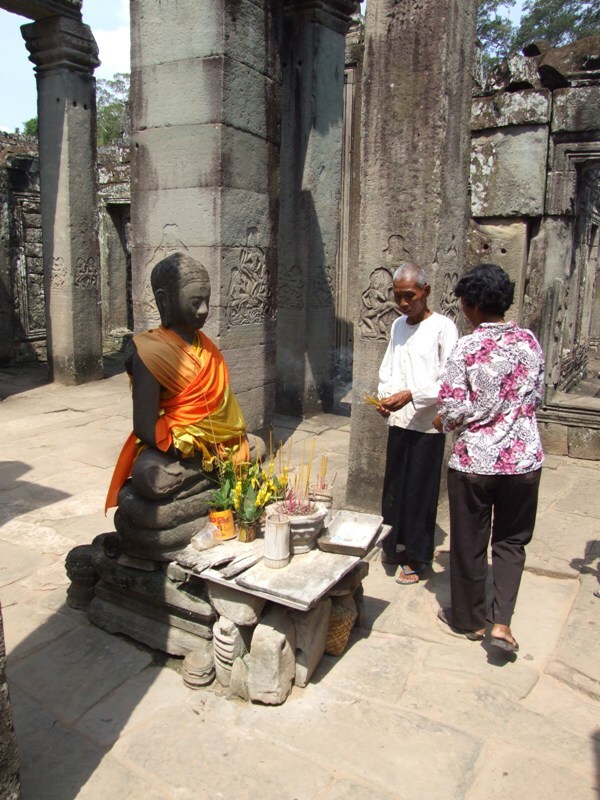 One of the wonders of Angkor Thom is the visitors ability to explore. 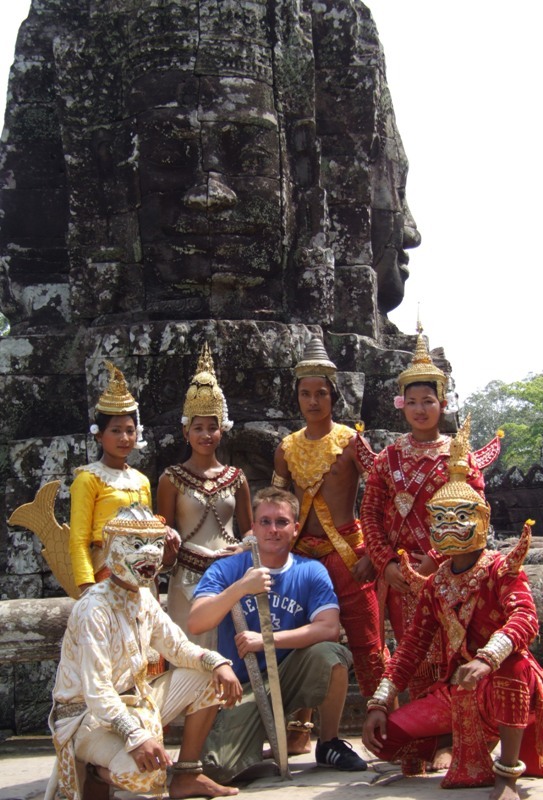 Angkor Thom is a huge complex with many structures and much jungle territory to explore if you are adventurous enough. It’s as if you are Indiana Jones or Lara Croft in search of ancient treasures and artifacts. 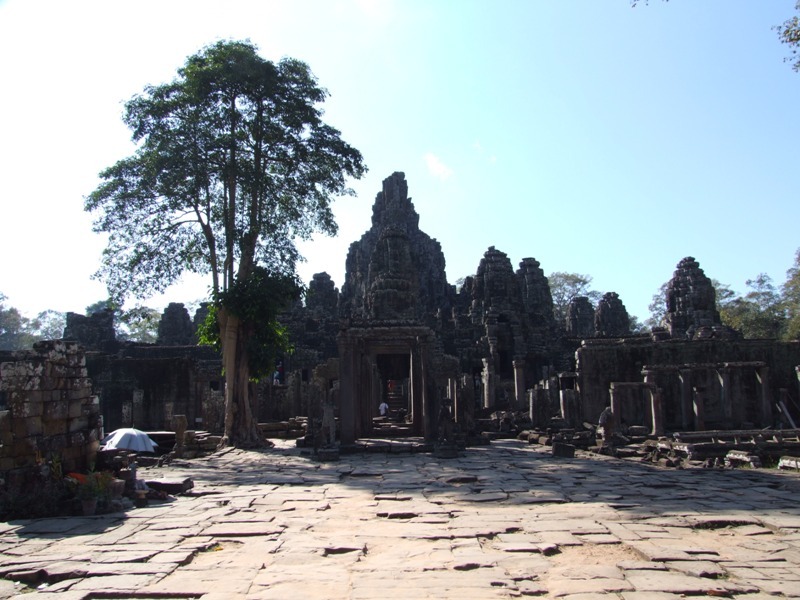 Much as Indie and the Tombraider braved the elements, you will likewise battle heat exhaustion, sunburn, torrential downpours, dehydration and most of all the crowds of tourists in order to catch an inspirational glimpse and be awe stricken by these ancient and eternal monuments to Khmer civilization. 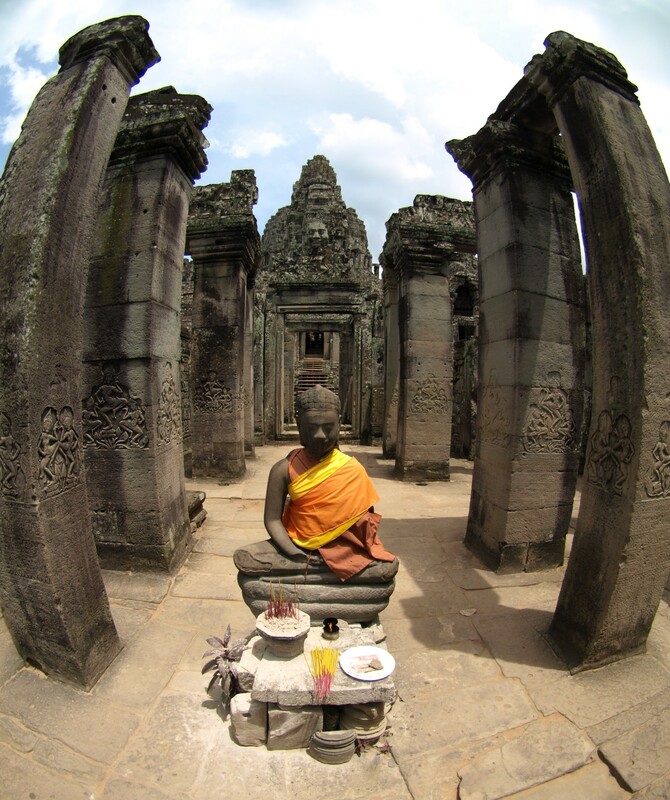 The best time to view Bayon is early morning. 5 or 6 A.M. As the sun breaks the horizon and turns to gold the beautiful smiling faces on the towers. Sunset is a wonder to behold on the steps of Angkor Thom and Angkor Wat. These are cherished memories. One will never forget. These are moments and vistas that defy description. Getting out early will not only let you beat the heat and sun but the thousands of tourists who will be out a few hours later. 2nd best time to catch any of the monuments is Noon when most of the tour groups are taking a lunch break. 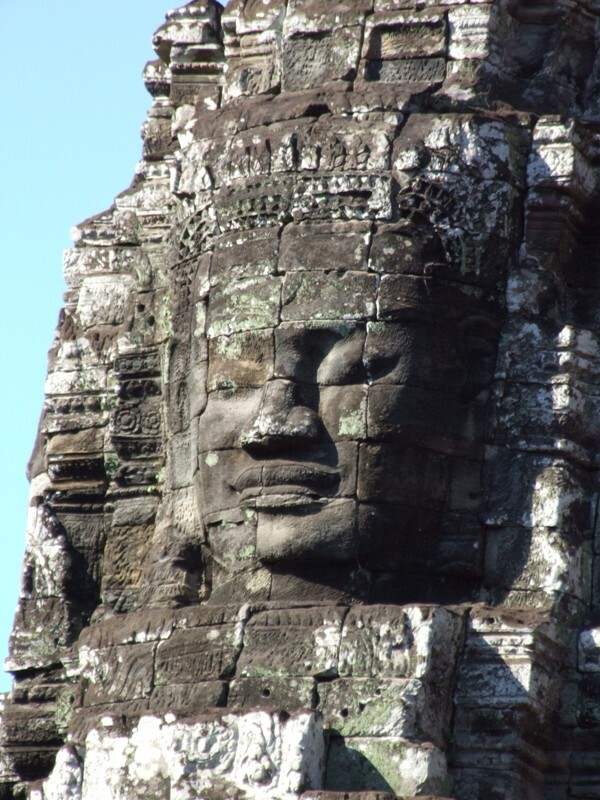 Jayavarman VII established the Angkor Thom in the late 12th century. It was the last great city of the Angkorean Khmer. 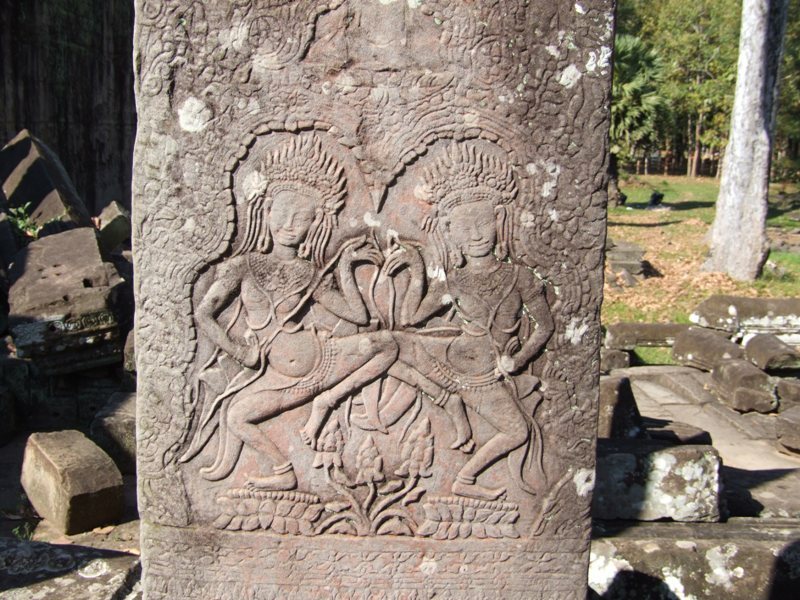 Thankfully, when the Ayutthayan centered kingdom of Siam conquered the area, they did not destroy everything and left us these beautiful Khmer monuments to awe and inspire us for ages to come.